For much the same reason LCD televisions offer eye-popping performance, a thermomagnetic processing method developed at the Department of Energy's Oak Ridge National Laboratory can advance the performance of polymers. Polymers are used in cars, planes and hundreds of consumer products, and scientists have long been challenged to create polymers that are immune to shape-altering thermal expansion. One way to achieve this goal is to develop highly directional crystalline structures that mimic those of transparent liquid crystal diode, or LCD, films of television and computer screens. Unfortunately, polymers typically feature random microstructures rather than the perfectly aligned microstructure - and transparency - of the LCD film. ORNL's Orlando Rios and collaborators at Washington State University have pushed this barrier aside with a processing system that changes the microstructure and mechanical properties of a liquid crystalline epoxy resin. 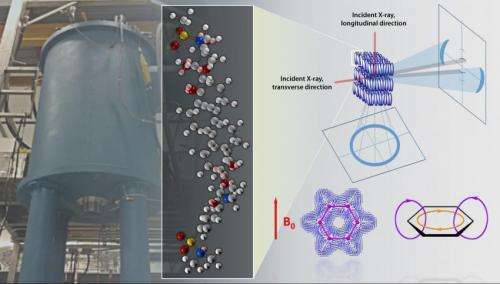 Their finding, outlined in a paper published in the American Chemical Society journal Applied Materials and Interfaces, offers a potential path to new structural designs and functional composites with improved properties. The method combines conventional heat processing with the application of powerful magnetic fields generated by superconducting magnets. This provides a lever researchers can use to control the orientation of the molecules and, ultimately, the crystal alignment. "In this way, we can achieve our goal of a zero thermal expansion coefficient and a polymer that is highly crystalline," said Rios, a member of ORNL's Deposition Science Group. "And this means we have the potential to dial in the desired properties for the epoxy resin polymers that are so prevalent today." Epoxy is commonly used in structural composites, bonded magnets and coatings. Rios noted that thermosets such as epoxy undergo a chemical cross-linking reaction that hardens or sets the material. Conventional epoxy typically consists of randomly oriented molecules with the molecular chains pointing in every direction, almost like a spider web of atoms. "Using thermomagnetic processing and magnetically responsive molecular chains, we are able to form highly aligned structures analogous to many stacks of plates sitting on a shelf," Rios said. "We confirmed the directionality of this structure using X-ray measurements, mechanical properties and thermal expansion." More information: "Thermomagnetic processing of liquid crystalline epoxy resins and their mechanical characterization using nanoindentation," Applied Materials and Interfaces, 2014.